CLARUS, a wealthy man and native of Tours, St. Clarus renounced all of his wealth and power and entered Marmoutier Abbey. 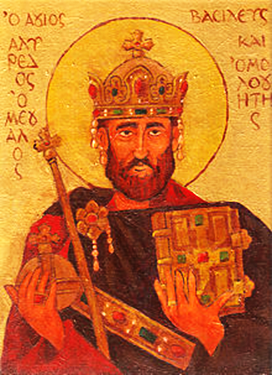 There he was a disciple of St. Martin (11th November). He numbered St. Paulinus of Nola (22nd June) and the priest and ecclesiastical historian Sulpicius Severus (†c.420) amongst his friends. Shortly after his ordination to the priesthood, St. Clarus went to live as a hermit near the abbey, where he reposed circa 397. CYBI (CUBY), (Sixth Century), our father among the saints Cybi was a sixth-century Cornish abbot, bishop and, briefly, king. Along with St. Seiriol (1st February), he is one of the most famous saints of Anglesey in Wales. The majority of information on St. Cybi derives from two Latin versions of a twelfth-century Welsh Life, which are part of the Cotton Manuscripts at the British Library. There are those who question how accurate these are, but Baring-Gould, based upon other research and manuscripts including the Peniarth Manuscripts , is comfortable with them. The Iolo Manuscripts have some further information on St. Cybi, but these are of an even later date and Baring-Gould is doubtful as to their accuracy. As a young man, St. Cybi went on a pilgrimage to Rome and Jerusalem. At some point on this pilgrimage, he was ordained to the priesthood and subsequently consecrated bishop. Upon his return to Cornwall, St. Cybi found that his father had reposed, and he was now King of Cornwall. St. Cybi politely declined the throne and, instead, travelled throughout Cornwall, preaching the Gospel. His travels ended when he, along with ten disciples, settled near Tregony, Cornwall. After several years at Tregony, St. Cybi spent some time in Ireland, and then to Wales where he finally settled. There he founded, and was the first Abbot of, a monastery in the ruins of a Roman fortlet located in the centre of present-day Holyhead in Anglesey, which came to be called Caer Gybi (the fortress of Cybi). St. Cybi reposed 8th November 555 and was buried in Capel y Bedd (the Chapel of the Grave) adjoining his monastery at Holyhead. St. Cybi is the patron saint of Llangibby and Llangybi in Wales, as well as Tregony, Landulph and Cuby in Cornwall. In addition, several churches in Wales and Cornwall were named for him. and will show us great mercy. DEUSDEDIT (ADEODATUS I), sixty-eighth Pope of Rome from 615 until his repose in 618. St. Deusdedit is especially remembered for the care of his flock. When his diocese was struck by an outbreak of leprosy St. Deusdedit worked directly with those suffering, as he also did when an earthquake struck his See. It is highly likely that St. Deusdedit was the first Pope to use lead seals or bullae (from which the expression Papal Bull comes) on his decrees. FOUR CROWNED MARTYRS, there are, in fact, two distinct groups known as the Four Crowned Martyrs from the Diocletianic Persecution. The first group: (Secundus, Severian, Carpophorus and Victorinus) were martyred in Albano near Rome. 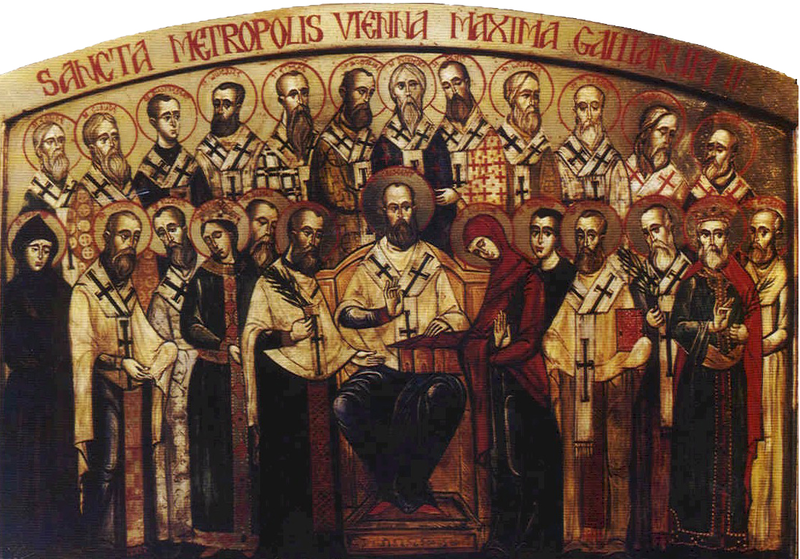 The second group, which numbered five, not four, (Claudius, Nicostratus, Symphorian, Castorius, and Simplicius), were martyred in Pannonia. The relics of four of the martyrs from the second group were brought to Rome, hence, the veneration of four, not five, began. GERVADIUS (GERNARD, GARNET), (Tenth Century), a native of Ireland who went to Scotland where he lived as a hermit near Elgin in Moray. His cave was a place of pilgrimage until the nineteenth century, when the site became a quarry. MAURUS, according to local tradition, St. Maurus was the second Bishop of Verdun, serving from 353 until his repose in 383. 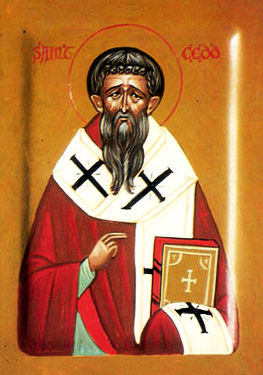 However, St. Polychronius (30th April) counted as the fifth Bishop of Verdun, circa 454 – circa 470, is the first bishop for whom historical documentation is extant. Over the centuries, many miracles have been reported to have taken place at his tomb, which reached their apex in the ninth century, which coincides with the translation and enshrinement of St. Maurus' relics. MOROC, (Ninth Century), a ninth-century Bishop of Dunblane, Stirling, Scotland. In the old Scottish Rite, he was venerated with a solemn Office. Some sources, without support, assert he was at one-point Abbot of a monastery in Dunkeld, Perth and Kinross, Scotland. TYSILIO (TYSSEL, TYSSILO, SULIAU), (Seventh Century), there is little Welsh sourced information about him that has survived, with the exception of a few passing references to him in the Buchedd Beuno (Life of St. Beuno), a poem commemorating him written by the twelfth-century court poet Cynddelw Brydydd Mawr, and material in the Bonedd y Saint . Traditions about his early life are in the Latin Life of St. Sulinus (Suliac) of East Brittany , though there are scholars who believe the Life of St. Sulinus is simply a reworked version of a life of St. Tysilio. It is possible that a separate St. Suliac did exist, as is evidenced by the name of the commune of Saint-Suliac on the River Rance in Brittany, though most French sources claim SS. Tysilio and Suliac are one and the same, and he just went by different names on Wales and Brittany. According to extant sources, Tysilio was a son of Brochfael Ysgithrog ap Cyngen, King of Powys, and of Arddun Benasgell ferch Pabo, believed to have been of northern British descent. If this is true St. Tysilio flourished in the late sixth or early seventh century. The assertion that he was a member of the ruling dynasty of Powys may explain both the significant cult that rapidly developed following St. Tysilio’s repose and the significance of his church at Meifod, which was where the kings of Powys were buried. However, it must be kept in mind that royal ancestry was regularly imputed to saints in Celtic hagiography during the Middle Ages. According to Welsh tradition St. Tysilio received monastic tonsure from Abbot Gwyddfarch at the monastery at Meifod. After several years at Meifod, St. Tysilio left and founded the church at Llandysilio on the Anglesey side of the Menai Strait. After serving his flock in Llandysilio for seven years, St. Tysilio returned to Meifod where he succeeded Gwyddfarch as Abbot. The Breton version of St. Tysilio’s Life claims that persecution by Haiarme, the childless widow of St. Tysilio’s brother, the deceased King Iago, forced him to flee to Brittany. However, there is no record extant of the existence of an Iago, son of Brochfael. In all probability Brochfael was succeeded in the kingship by his son Cynan Garwyn. It is likely that the persecution and subsequent exile of St. Tysilio was invented to explain his emigration to Brittany, and further support the identification with St. Suliac. The Breton version goes on to say that St. Tysilio landed at the mouth of the River Rance near present-day Saint-Malo. There he met with St. Malo (15th November), then continued upstream for about 13 km (8 mi. ), settling at what is today Saint-Suliac, where he built a church. Though various entreaties to return to Wales were made by the Meifod community, St. Tysilio remained in Brittany until his repose. If this is true, it conflicts with the writings of Cynddelw, who reports that St. Tysilio was present at the battle of Maserfelth (Maes Cogwy) – believed to be present day Oswestry in Shropshire – between Penda of Mercia and King St. Oswald of Northumbria (August 641 or 2). If the later parts of the Breton Life are disregarded it is possible that St. Tysilio was still flourishing in Wales in 642, a chronological near impossibility given that Brochfael Ysgithrog flourished a century earlier. The Welsh cult of St. Tysilio is centred at Meifod in Montgomeryshire, where he is the patron of the monastic church. The cult is also active in a small number of parishes in south Denbighshire (including a parish in Llandysilio-yn-Iâl and one in nearby Abersili), and north Montgomeryshire (including Llandysilio, and possibly Llandysul). The Breton Life of St. Sulinus mentions Llandysilio on Anglesey, and several churches elsewhere in Wales believed to be dedicated to St. Tysilio. These include Llandysilio on the Pembrokeshire–Carmarthenshire border, as well as Llandysiliogogo and possibly Llandysul in Cardiganshire. The Bonedd y Saint lists a Tysul ap Corun, and a Tysilio ab Enoc as two separate saints whose ancestry is wholly from Cardiganshire. Hence, it is possible that some of the south-western dedications could be to one, or both of these saints. and live only in Christ for the salvation of men’s souls. WILLEHAD of BREMEN, a Northumbrian monk who left England circa 766 – 772 to follow in St. Boniface's (5th June) footsteps in enlightening the Frisians. Not only was St. Willehad's mission quite successful, it was also wide spread — he was the first missionary to cross the Elbe. Following his conquering of the Saxons, Charlemagne had St. Willehad consecrated the founding Bishop of the See of Bremen (787). St. Willehad reposed in his See in 789. WIOMAD (WEOMADUS), a monk at the Abbey of St. Maximin in Trier, who became Abbot of the Abbey of SS. Peter and Mary in Mettlach. St. Wiomad was Bishop of Trier circa 750, his episcopacy continuing until his repose circa 790.